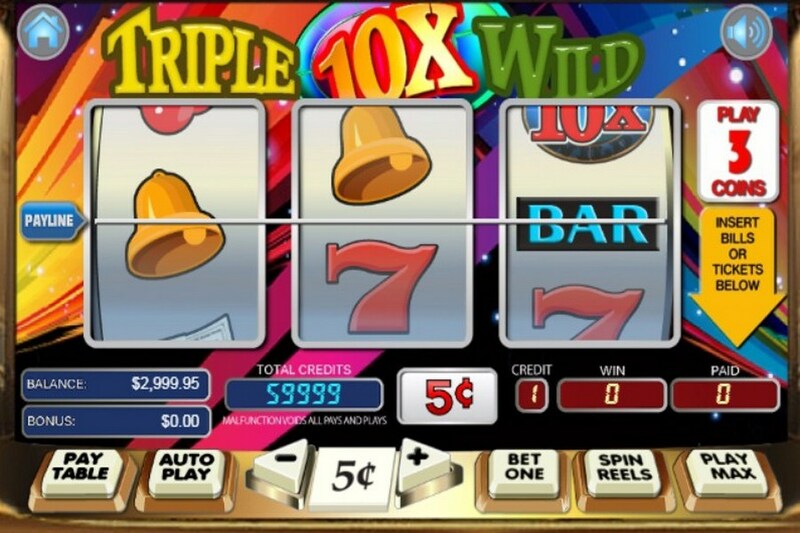 Casino software developer WGS has created some amazing Vegas style online slot games over the years and one of the popular titles that attracts attention online is Triple 10x Wild. With this game, players will enjoy a classic three reel game with a single payline. This slot does not compare to video slots of today that offer bonus features, animations or 3D graphics. It is a basic slot machine game that is geared towards those that want a true Vegas experience and a chance to win a pretty impressive jackpot payout. When playing Triple 10x wild, players can alter their bet amounts to suit their budget. The game can be played as a penny slot and players will have the ability to wager as many as 3 credits per spin. The maximum denomination supported is $10, so for a $30 max bet, players will be playing for the 30,000 coin jackpot. 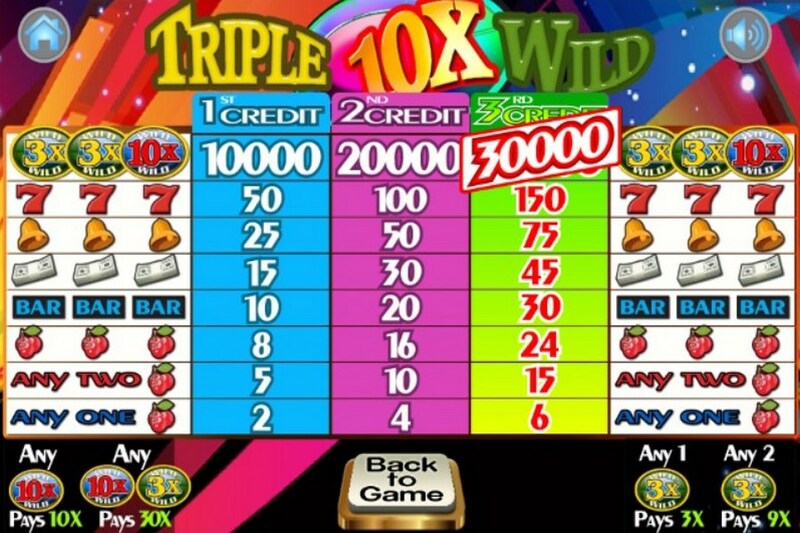 Since this is a classic slot machine game with a single payline, there is no bonus round offered with Triple 10x Wild. However, players can combine the wild symbols for larger rewards and will find this game to be one of the more rewarding three reel slots being offered online. When the reels spin, players will see 7 different slots symbols in the game. The most important slots symbols that are used at the two multiplying wild icons. These can offer 3x and 10x the normal payout. 3x and 10x wild symbols may appear on all reels and will multiply your winnings, offering the chance to get 30x the normal payouts from the game. To win the top payout of 30,000 coins, players will have to bet 3 coins and have all wilds present in a spin, the 3x on reels one and two and the 10x on reel 3. The online slot game is capable of offering some stunning wins. The lowest payout is a 2 credit reward, which is offered on a one coin bet with a single strawberry. Those that are playing one coin will have the chance to win a top payout of 10,000 coins. When betting two coins, the payouts are all doubled. The best rewards will come from a three coin bet, which is how the top payout of 30,000 coins can be achieved with all wilds. 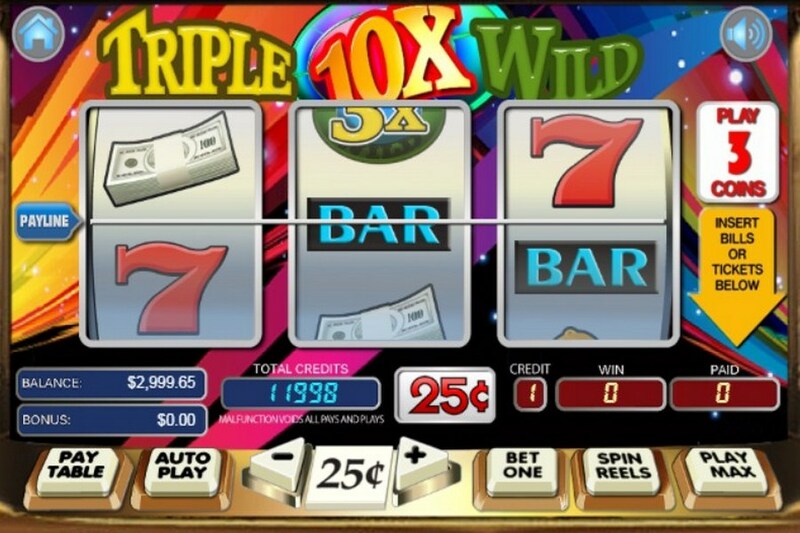 The Triple 10x Wild online slot game is a very volatile slot, however thanks to it being a multi-denomination slot that does of course mean when playing it even on the lowest stake level you could win big, in fact very big!